At least 400 people have been left homeless by the 4.8-magnitude earthquake that struck towns near the Mount Etna volcano, Italy's Civil Protection Agency said Thursday.. Earlier, agency chief Angelo Borrelli told RAI state radio that 10 people had been hospitalized, and another 18 required medication but were not hospitalized. ‘We do not have seriously injured people’ apart from an 80-year-old woman whose body was crushed but who is not in a life-threatening situation, Borrelli said. Borrelli also said the Civil Protection Agency had received calls to inspect 1,600 sites for earthquake-related damages. The central government will meet in Rome on Friday to declare a state of emergency in the affected areas, Deputy Prime Minister and Five Star Movement leader Luigi Di Maio said. A state of emergency allows authorities to sidestep usual bureaucratic rules, allowing for faster relief work. Di Maio spoke in a joint press conference with Italy's other deputy prime minister, League leader Matteo Salvini, after both men visited quake-stricken municipalities. According to experts, ‘the situation is under control,’ Salvini said. 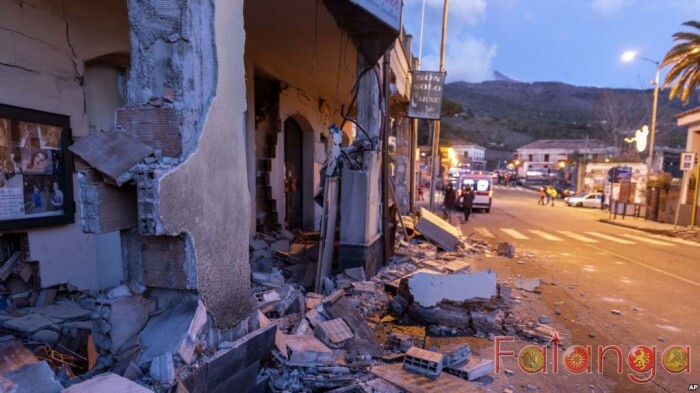 The earthquake happened early on Wednesday near the town of Viagrande, on Etna's eastern slope, and came after smaller shocks and volcanic eruptions recorded on Monday. Borrelli rejected suggestions that the population could have been alerted about the danger; ‘Obviously we cannot predict earthquakes,’ he said on RAI. But he admitted that local authorities in the Etna area do not have proper emergency plans to deal with such crises. ‘It is a sore point which we have to address,’ he said. Mount Etna is one of the most active volcanoes in the world with frequent eruptions, both large and small. At more than 3,300 metres high, the volcano is one of the highest in Europe.